Heart and Sole™ is a premium-quality, purified fish oil formula that provides high elemental levels of EPA and DHA, two of the most studied omega-3 essential fatty acids. EPA and DHA (Omega-3 fatty acids) are considered essential because the body requires them but is unable to manufacture them. Humans must thereby obtain them through diet. Sardines and Anchovies are the best and most economical sources of these omega-3s. Unfortunately, most people do not consume enough of these in their diet, and must supplement in order to maintain health. 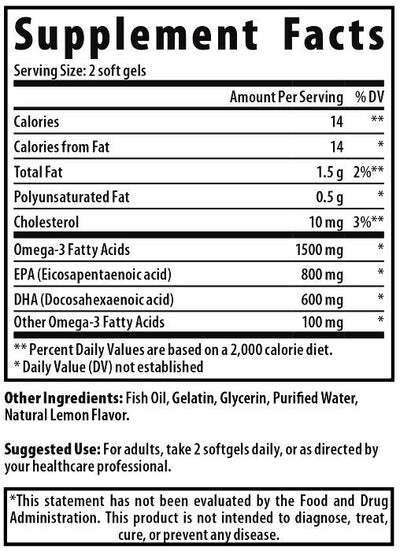 How does fish oil support health? Consumption of an adequate dosage of EPA and DHA is demonstrated to reduce the risk of heart attack and stroke by as much as 15%, DHA is useful for individuals with neuropathy and reduction in the risk of dementia.